This is something I’ve written and lectured about before in terms of the psychology of competition in video games. Social Comparison Theory argues that information about our performance on some task (such as playing a Heroes of the Storm match) is of little value in isolation. I inflicted 23,639 points of Hero Damage. Is that good? Bad? Average? I have no idea. In such cases people seek out other people to compare themselves against. The more similar that person is, the better. So knowing how much Hero Damage I racked up isn’t what makes me feel good or motivated to improve. It’s knowing how much that is relative to other people like me. That’s why the Heroes of the Storm team was clever to insert that second bit of information: “more than similar players’ average of 13,321.9.” It makes the information useful and allows me to leave the match with some positive feedback and warm fuzzies. 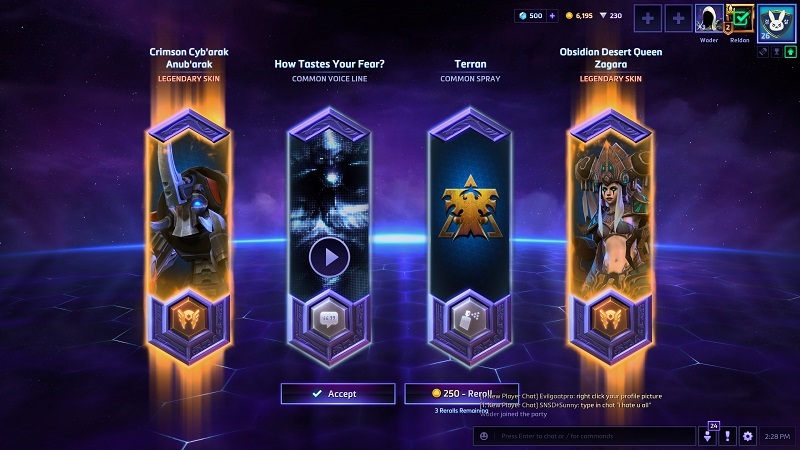 Also there was that time I got TWO legendary skins from one loot box. This has nothing to do with the rest of this article, I just wanted to brag. 1. Or, more likely, some smart person over there independently came up with a good idea. But allow me this fantasy, okay? That’s why I like the leaderboards in Forza, where it prominently tells you what your percentile ranking was. Knowing that you placed 7%th is a lot better than just being #4173 (way too many games don’t even tell you how many total are even on the leaderboard, so you can’t even calculate it yourself).